A large tsuba with a design of two flying cranes. The tsuba (鍔, or 鐔) is usually a round or occasionally squarish guard at the end of the grip of bladed Japanese weapons, like the katana and its various declinations (tachi, wakizashi etc. ), tantō, or naginata. They contribute to the balance of the weapon and to the protection of the hand. The tsuba was mostly meant to be used to prevent the hand from sliding onto the blade during thrusts as opposed to protecting from an opponent's blade. The chudan no kamae guard  is determined by the tsuba and the curvature of the blade. The diameter of the average katana tsuba is 7.5–8 centimetres (3.0–3.1 in), wakizashi tsuba is 6.2–6.6 cm (2.4–2.6 in), and tantō tsuba is 4.5–6 cm (1.8–2.4 in). During the Muromachi period (1333–1573) and the Momoyama period (1573–1603) Tsuba were more for functionality than for decoration, being made of stronger metals and designs. During the Edo period (1603–1868) there was peace in Japan so tsuba became more ornamental and made of less practical metals such as gold. Tsuba are usually finely decorated, and nowadays are collectors' items. 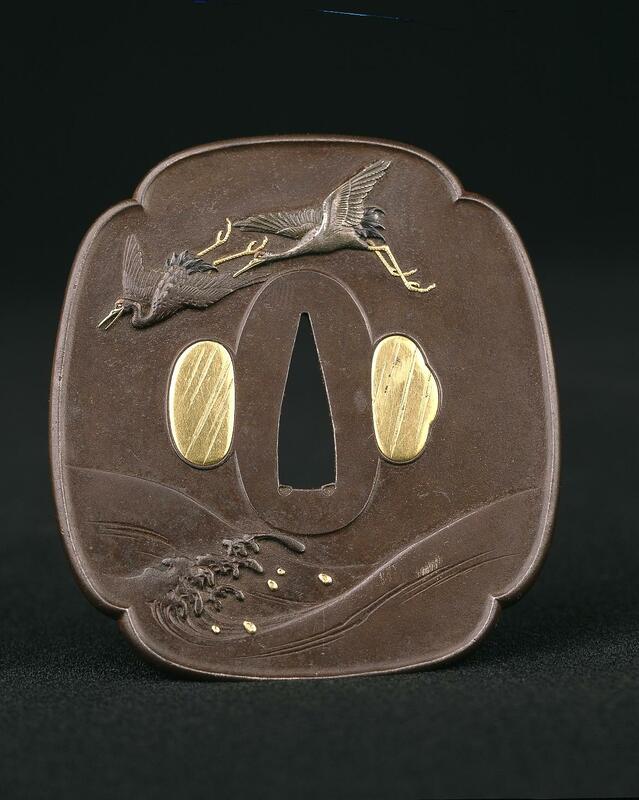 Tsuba were made by whole dynasties of craftsmen whose only craft was making tsuba. They were usually lavishly decorated. In addition to being collectors items, they were often used as heirlooms, passed from one generation to the next. Japanese families with samurai roots sometimes have their family crest (mon) crafted onto a tsuba. Tsuba can be found in a variety of metals and alloys, including iron, steel, brass, copper and shakudo. In a duel, two participants may lock their katana together at the point of the tsuba and push, trying to gain a better position from which to strike the other down. This is known as tsubazeriai (鍔迫り合い), lit. pushing tsuba against each other. Tsubazeriai is a common sight in modern kendo. 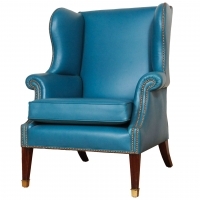 Lovely brightblue leather upholstered English wingchair.